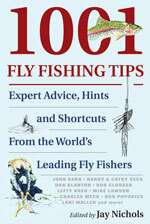 Increase your odds by covering multiple bases with multiple flies. Fish both the adult and emerger, or emerger and nymph, or another combination. CARRY SEVERAL sizes of the same pattern. Always carry the size that most appropriately matches the hatch; but also carry smaller patterns. Carry several patterns that match the same hatch. For the most common hatches, I carry hackled, parachute, and Compara-dun style versions of the same fly. Sink the pattern, if changing size or pattern doesn’t work. Move during the hatch if you don’t see risers. Don’t be afraid to drive or walk up or downstream. Sometimes fish tend to pod up; other times, water or hatch conditions vary in a stream from one area to the next. Arrive at the right time. Know when the bugs hatch and be there. In the spring, fall, and winter this is often midday; in the summer, plan to be on the water late. Fish on lousy days. Aquatic insects that hatch on overcast days tend to remain on the surface longer than when they hatch on bright sunny days. Trout are also less wary and feed more readily on cloudy, overcast days. Fish tandem flies. Cover multiple bases with multiple flies. Fish both the adult and emerger, or emerger and nymph, or another combination. Travel. Extend your fishing time for the super hatches — Green Drakes, for instance — by traveling from stream to stream, generally from south to north or from low to high elevation to follow the hatches at their peaks. Location is everything. Sulphurs and drakes emerge in totally different areas of stream in different habitats. 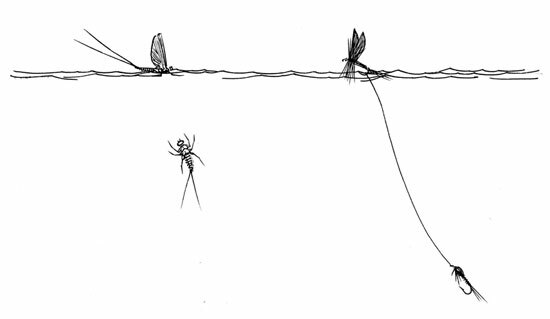 Drakes prefer silty bottoms; Sulphurs (and many other mayflies) prefer riffles. Learn and seek out the habitats different insects prefer. Take time out to identify what is hatching. You don’t need to know Latin, but sometimes a bug looks a different color or size up close than it does flying in the air. Take time to discern how fish are feeding on the insects: Are they boiling just under the surface or leaping out of the water?